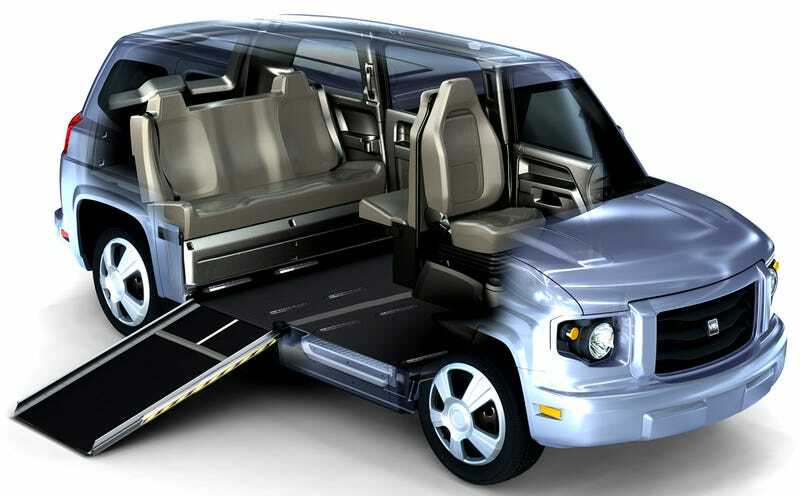 The Vehicle Production Group had a very interesting idea: a van built from the ground up for people with disabilities in mind, rather than an existing car retrofitted to accommodate a wheelchair. Unfortunately, despite a $50 million taxpayer loan, the company failed last year. But now they're back! Indiana TV station WBST reports that the MV-1 van is back in production, and this time the operation is being run directly by AM General, the manufacturer of the Humvee who previously built the vans under contract. Originally the VPG project was supposed to produce 900 jobs, produce 22,000 vans annually and take 12,200 tons of carbon dioxide out of the air each year, which is apparently why it got funding under the Department of Energy's Advanced Vehicle Technology Manufacturing "green loan" program that also funded Tesla and Fisker. But the Energy Department froze VPG's assets when they weren't meeting their targets. The body-on-frame MV-1, powered by either a 4.6-liter Ford V8 or a natural gas engine and equipped with a wheelchair ramp, was used as taxi cabs and sold to private customers. Officials at the company blamed a lack of strong dealers who could sell the van, but despite their problems the vehicle itself proved extremely popular in the disabled community. WBST reports AM General plans on producing 5,600 MV-1 vehicles this year. They will be priced between $50,000 and $60,000, depending on the model. The van itself is a solid product, so let's hope they have better luck making it work than VPG did.